1. Kayseri Airport: Kayseri Airport is an hour drive from Cappadocia. Most flights to the region arrive in Kayseri and the airport is well connected to Istanbul and Ankara. There are very few international flights to Kayseri. 2. Nevsehir Airport: The small regional airport is reached almost exclusively from Istanbul and Ankara and not via main charter airlines. It is closer to the attractions of Cappadocia, half an hour’s drive from Goreme. 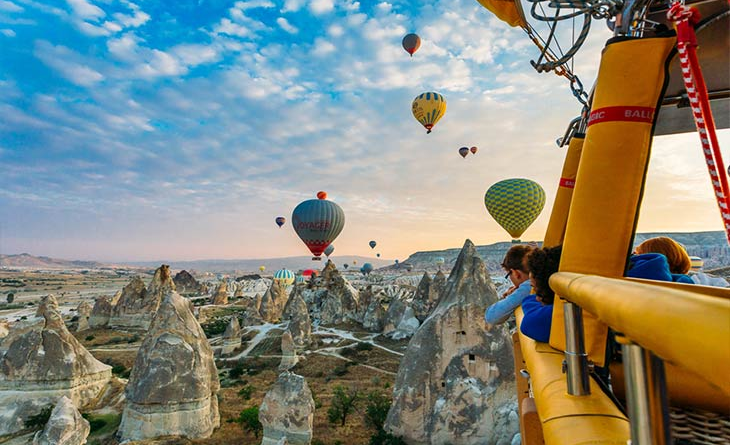 (3rd airport Antalya): For the Cappadocia tours, people sometimes fly to Antalya. From there you drive first to Konya and then to Cappadocia. Driving might take up to 8 hours. Without a tour group or a planned road trip, it is recommended flying to Nevsehir or Kayseri as the drive from Antalya takes several hours. here are limited International Direct flights to Kayseri or Nevsehir. That’s why you almost always have connected flight via in Istanbul or Ankara. Most connections from Istanbul Ataturk Airport, Istanbul Sabiha Gokcen and Ankara Esenboga to Kayseri. A round-trip flight to Kayseri from Istanbul is between 50 and 100 €. Group transfer: A shared bus picks you up and other travelers at the airport and brings you to the hotel. Since you often have to wait for other travelers at the airport and stop at several hotels on the way, the journey takes longer than with a private transfer. You pay in buses per seat. Private Transfer: A private driver picks you up from the airport and brings you directly to the hotel. You pay a price per route, in contrast to the buses. As a result, private transfers with three people in the car are only a few euros more expensive than a group transfer. Taxi: I do not recommend the taxi ride in Cappadocia. With a normal taximeter ride from Kayseri to Cappadocia you pay more than 100 €. It is better to book a private transfer, which costs half. Public: You have to go to Kayseri bus station, which called “Otogar” and get on the bus to Cappadocia-Goreme. The buses run every 60 minutes a day, a ticket currently costs 15 Turkish Lira ($3), without a Turkish phone number you can only buy it locally. From Nevsehir airport the typical Turkish Dolmus buses go to Cappadocia. Public bus travel takes much longer from both airports than with a shared transfer. ← What Stops You Quitting Your Job and Travel the World?